Life’s journey is full of twists and turns. What lies ahead is not always expected. Less than three years ago, Mexico’s Irene Aldana had never stepped into a cage as a professional mixed martial artist. Although she always had a passion for sports, the 26-year-old appeared destined for a career in photography and her own studio. “I love photography,” declared Aldana. “I would love to continue with that plan in the future. If I’m good at something and if I really love it, I should do something with it. Shooting photos and punching people in the face may seem like a contrast on the surface, but a deeper look at Aldana’s youth reveals someone destined for competition. After moving to Guadalajara, Aldana discovered MMA and fell in love with the sport. “The mix of all martial arts in one sport, I found fascinating; how distinct disciplines could be combined and how they complemented each other,” said the bantamweight. “Also the way you are able to connect your mind and body and go beyond your limits. Her debut came in 2012 and lasted just 15 seconds. A year later, her second bout was over in 20 seconds and her third fight — which took place the same night as the second — ended with a violent wheel kick in just 43 seconds. Aldana’s career path was suddenly very clear. Although she faced a setback in Brazil prior to signing with Invicta FC in 2014, Aldana and her Lobo Gym teammate, Alexa Grasso, have quickly become the faces of women’s MMA in their native Mexico. Now they’re out to set an example for their fans. With her country behind her, Aldana made her first appearance in the Invicta cage in September at Invicta FC 8, where she was pitted against UFC veteran Peggy Morgan. After rocking Morgan in the opening moments of the fight, Aldana coerced a tap via rear-naked choke in under three minutes. It’s a night that Aldana won’t forget anytime soon. “I was really, really nervous,” admitted the fighter. “I tried to focus the best I could and channel that into my objectives. “I knew Peggy is really strong and she is well known as a fighter almost impossible to knock out. I knew she always goes forward and resists damage. I was prepared for that and I didn’t get scared because she recovered. I knew that could happen. Aiding Aldana’s performance in Kansas City was the benefit of watching teammate Grasso earn a decision win just before Aldana stepped into the cage. With four first-round finishes in her four career wins, Aldana was set to continue her early career momentum at Invicta FC 10 in December. However, a case of bronchitis forced her off the card at the last minute. Now, she’s slated to take on veteran Colleen Schneider at Invicta FC 11 on Feb. 27 in Los Angeles. Following her dominant promotional debut against Morgan, it would be easy to understand if Aldana felt obligated to repeat her performance when she goes up against Schneider, but she insists that’s not the case. 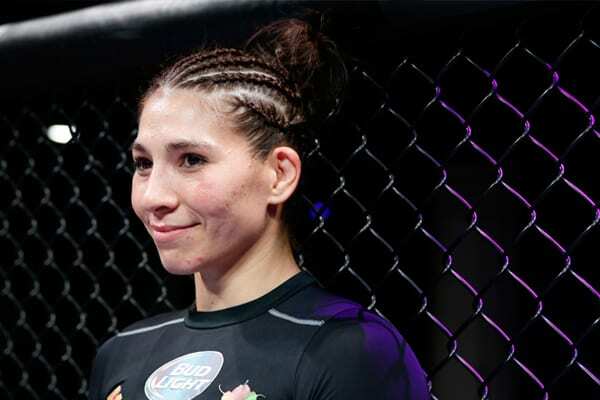 Should Aldana get around Schneider in Los Angeles, the Mexican would be a prime candidate for a shot at the vacant 135-pound Invicta bantamweight championship. She’s confident she’d be ready if called upon and is anxious to share a title with her fans. “I feel ready! I know I have a short career, but I always train like it’s for a title shot,” Aldana exclaimed. If Aldana’s career to date is any indication, her aspirations of Invicta gold are likely right around the corner. It all starts on Friday, Feb. 27, in Los Angeles. Irene would like to thank her MMA coach, Francisco Grasso, for who she is and who she will be in the sport, her physical conditioning coach, Fernando Quiroz, who knows how to train her effectively, her teammates for always being with her in good and bad times, her sponsors, they are like guardian angels for us in this sport, her family because she knows it’s hard for them to see her in the cage, but they have been very supportive with all their hearts, and all the fans for their support.